Considering our smartphones are capable of so much already, you would think they’d be perfect replacements for our TV remotes. Unfortunately, among so many apps offered to us daily for these purposes, finding an app that suits your media center and your Android smartphone at the same time is not easy. We decided to help you and we have for you one amazing app that will help you to enhance your media center and control all your Kodi’s. Let’s see what the offers you. This video player app is specially developed as one highly useful and efficient Kodi remote control that is very easy for using, complete and highly stable. Developed on android platform with the incredibly intuitive interface, this app offers its users the easiest and quickest way for them to enhance the media center, offering them the most helpful features that will completely satisfy any of their media needs. Configurable with all of the user’s needs and supporting all android versions, the app is a great choice for everyone that needs to get the best out of their media center. Yatse has to offer its users different and very useful features that will help them with their media center and Kodi’s. By using this app, users will be able to control every aspect of their center with an ease while easily streaming supported media to local Android devices or UPnP, AirPlay, Chromecast, Roku and Smart TV devices. 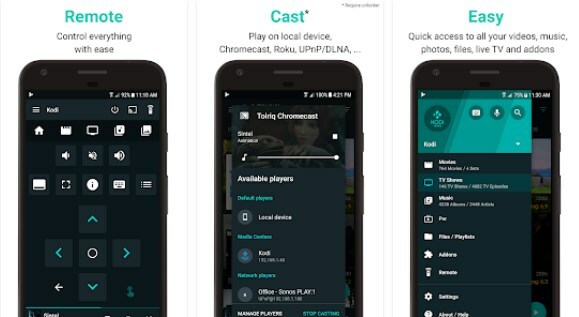 Also, with the help of this app users can cast, playing on local devices or their UPnP, AirPlay, Chromecast, Roku and Smart TV devices. The app is offering native support for Plex and Emby serves as the options for users to use voice commands while offering complete Full Android Wear and Auto support to the users. With this app, users can easily sync media to their devices for playing offline and can easily access their offline library or audio player if they want to listen to music. Users are offered multiple widgets for fast remote actions as the options of the lock screen and the efficient feature of custom customization. On the app, users can quickly find and access their media with global searching and filtering as they can choose from a direct selection of subtitles and audio streams. Also, the app allows users to send media from YouTube or browser and the app supports all themes and all versions of Android which makes it suitable for anyone android users that need to use it. Download this kodi remote app for free on Google Play now to easily remote control all your Kodi’s!